The Abari Foundation is dedicated to research, design and construction of sustainable and holistic structures using vernacular architecture and traditional materials through training and workshops. Abari Foundation collaborates with other like-minded organizations to promote the establishment of local entrepreneurs and social enterprises by providing support with business development, seed capital, and skill development for poverty alleviation. We approach a project holistically by envisioning workshops and training of local populous to share our technology and also learn lost arts of historic traditional buildings. This give and take dynamic has immensely helped us in engaging with various communities and providing them with not only a beautiful earthen structure but also a concept of waste water treatment, solar energy utilization and composting. On April 25 2015 Nepal was struck with a massive earthquake that took 8,712 lives and injured thousands. Additionally, 505,745 houses were destroyed and 279,330 damaged, forcing more than 11,100 households to be displaced. In this critical period, ABARI has been active in serving the needy ones; be it by building a house for a less fortunate woman (Sanu Maya Tamang) or by creating model villages in Nuwakot and Kavre, the two most suffered districts by the earthquake. Furthermore, ABARI has constructed 21 community shelters, 2 health posts, 92 transitional schools/ community shelters and 178 transitional shelters in few affected districts like Kathmandu, Bhaktapur, Dhading, Gorkha, Kavrepalanchok, Nuwakot and Sindhupalchok. Sanu Maya Tamang, is a single mother and she has often been shunned for being a widow and raising a differently abled child. Timal, Kavre an area predominantly populated by Tamang people, is located to the east of Kathmandu valley approximately 100 kilometers away. The earthquake affected 7 VDCs in Timal, damaging 1531 households and partial damaging of 3044 households. In addition, 50 schools were heavily damaged leaving thousands of children without proper education facilities. Considering the extent of damage, Abari in conjunction with Sathsathai Mundi, are helping the Timal community by training them with knowledge and skills necessary to build earthquake resilient schools and homes. While building a permanent model secondary school and two model homes, we will train 44 skilled carpenters and masons to enhance their existing knowledge in building earthquake resistant homes. These craftsmen will go on to assist villagers in constructing their homes, facilitating the process of owner driven reconstruction. Volunteers will participate in constructing buildings with rammed earth and bamboo, as decided in our designs of the model village. Each volunteer is required to fundraise $750 for the 10-Day program. The funds will help cover costs for food, accommodation, transport and other materials. Abari will house volunteers in a Community Facility Center/Yurt or in a villager’s home. We will also reinvest $150 of the funds raised by each volunteer directly in the project that the volunteers are working on. Rammed earth is an ancient technique for building walls, foundation and floors using natural raw materials such as earth, chalk, lime or gravel in a certain proportion. Rammed earth is simple to construct, non-combustible, strong and durable, making them more sustainable and environmentally friendly. 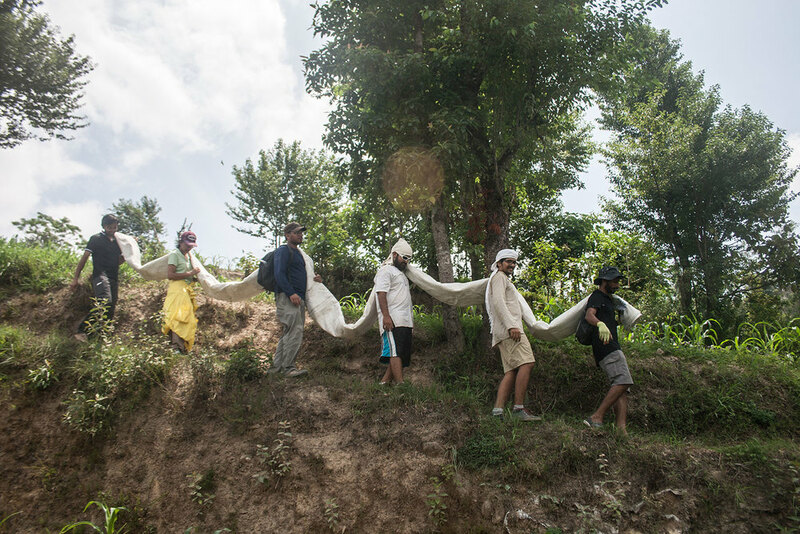 Volunteers choosing the Rammed Earth program will help reconstruct Sanu Maya Tamang’s home in Bhattedada, Dhulikhel. Compressed earth block is an environmentally friendly material that can build a house two stories high as long as the compression and earth to be used are appropriate. CEB is a mixture of non- plant soil consisting of gravel, sand and fine particles. The advantages of CEB such as uniformity, sound resistant, fire and insect resistant add more value to the design of vernacular architecture. Volunteers choosing the Brick Making and Laying program will help reconstruct Narayansthan Higher Secondary School in Timal, Kavrepalanchok. Stone Masonry involves masonry walls made with dressed stones which are sized and shaped to the right dimension. It involves using keystone locking mechanism at regular intervals to keep the masonry tight in place. It could be arranged using mud mortar or a cement mortar. Stone masonry has fairly good thermal properties,but when coupled with a mud plaster surface finish, it is comfortable in both extreme seasons. Mud plasters are less toxic and energy intensive than many other walls coverings, making it more appealing to the environmentally conscious. It is also easily repairable and inexpensive. Although permeable to water vapor, mud plaster resists water penetration. Bamboo is a versatile, strong, renewable and environmentally friendly construction material. It can resist forces created by earthquake and high velocity wind. Bamboo trusses are usually preferred because their local availability and economical aspects. Bamboo is favored for truss making because they are lighter in density than steel but can be as strong as mild steel in terms of strength. Wattle and Daub is a method of construction, consisting of plain weave of vertically placed bamboo post, and horizontally disposed thin wooden strips (wattle). These interwoven elements are then daubed in a kind of plaster, made up of variety of materials depending on location and availability, but most commonly mud, clay, animal manure, sand and straw. We are committed to providing Nepali volunteers with subsidized rates. Please contact us at volunteer@abari.org for more information. What skills do you have that you feel are relevant to volunteer in Nepal? Have you had any similar experiences in the past? What is your expectation from this volunteer program? Any ideas or comment you wish to share? Thank you for signing up we will get back to you soon !